Cyberhate Symposium – Can You Help? Sometimes I can’t believe where the world has taken me. Sometimes I have to stop, blink and ask myself whose life this is that I am living. Sometimes I need to remind myself that I’m not a frightened kid who doesn’t fit in and that I have come so far in my 44 and bit years of life. But that said, it has brought me to so much more than it has taken away. I have found stronger friendships that give so much to me. I’ve had so many amazing opportunities to work with incredibly talented and dedicated people, and it has given me a sense of confidence and accomplishment that I never had before. So while it is not easy, it is always worth it. And sometimes, the whole thing goes full circle – you engage in activism, it draws you harassment and abuse, amazing people who are also subjected to that harassment and abuse ask to work with you, and then new opportunities for activism come your way. This is how I came to be involved with The Cyberhate Project. Some time ago, I heard about Dr Emma Jane from the University of NSW and The Cyberhate Project and that she was conducting interviews with Australian women who had experienced online abuse and harassment. Emma is doing some amazing work on this project and you may have already seen her book Misogyny Online, and if you’re in Australia, the TV series on the ABC, Cyberhate with Tara Moss. Not to mention a whole slew of papers and events, more of which you can find out about here. Recently, I was invited by Emma to participate in the upcoming Cyberhate Symposium, in Sydney in July. After we discussed the possibilities of my attending, Emma has asked me to be one of the keynote speakers at the symposium, something that I consider a great honour. Cue one of those “whose life is this?” moments! I am planning on attending and speaking about my experiences with dealing with online abuse and harassment as a feminist and fat activist, with particular focus on the long term impact that it has on those of us who are subjected to it, and how far we have yet to push the law and technology to meet the changing nature of the abuse and harassment of women – both online and off. However, financially I am not in a position where I can afford to cover my own costs to fly to Sydney and for accommodation. This is where you come in dear reader – I am starting off a GoFundMe page to help me cover these costs. In return, I hope to be able to publish my symposium piece here (or at least be able to share with you where it is published) and will write about the symposium here on my blog. I hope to be able to network with other participants and that this may open up more opportunities for activism, so that we collectively may be able to shift how the abuse and harassment of women online (and off) is both viewed by society in general, and more specifically be part of making changes to the law and technology to protect women and other minorities, while also putting in place more suitable repercussions for those who do engage in this abuse and harassment. 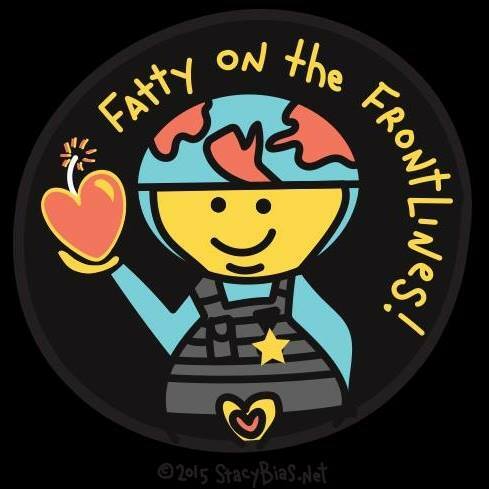 I would also like to have a fatty meet up in Sydney while I am down there, so that we can both make community connections with each other and generally just hang out in our fabulous fatness together! I don’t make money from my work as a feminist and fat activist, and a lot of the time it is a full time job on top of my day job. I have consciously chosen not to monetise this blog and the only time ads appear are the ones that WordPress puts at the bottom of this page (which can be removed by signing up to WordPress and remaining signed in to that account BTW) which I receive no revenue from. So it would mean a lot to me if any of you could help – particularly those who have stuck by me for about 9 years now of doing this work. I have set up a GoFundMe page here, and if you can help me meet this goal – anything you can afford is definitely appreciated.